2 Clubb Cottages01263 715779work01603 870304fax Self-catering2 Clubb Cottage is a delightful mid-terrace cottage dating back to 1880, nestled in the peaceful village of Baconsthorpe. Luxuries: Flatscreen TV with FreeSat, DVD Player, iPod Dock, WiFi. General: Electric radiators via air source heat pump, hot water via solar panel and wood burning effect fire. Utilities: Electric double oven, electric hob, Microwave, Fridge/freezer, Dishwasher, Washing machine. Rooms: 2 Bedrooms, 1 bathroom, 1 open plan sitting/dining room, 1 kitchen, 1 utility room. Beds: 1 Double, 1 single, 1 pull out truckle bed. Other: Books and Games. WiFi. Radio. Towels. Outdoors: Fully enclosed with paved terrace/patio, lawned area, table and chairs, BBQ. Access: Parking for two medium cars at the rear of the property. 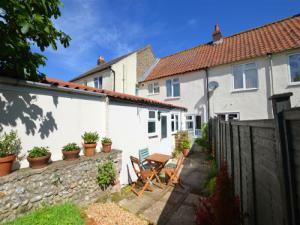 2 Clubb Cottage is a delightful mid-terrace cottage dating back to 1880, nestled in the peaceful village of Baconsthorpe.